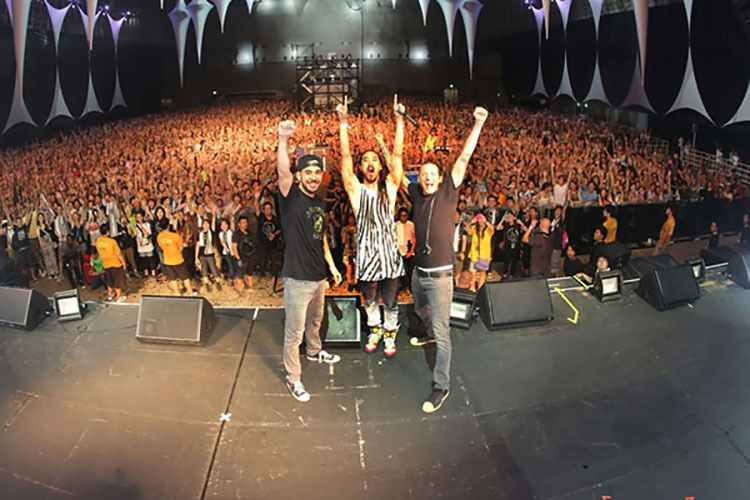 The first collaboration between Steve Aoki and Linkin Park wasn’t bad at all. I have it in my library of music and I play it from time to time. To hear they’ve collaborated again? Well, I can’t say I’m not excited to hear what they’ve done. What is hard to determine is exactly what portions of the video are from the new song “Horizons,” as it is clear that both drops are from songs by different artists. I understand that live, a full song might get boring and thus the two other drops are necessary. What we do hear however, are vocals from Chester and a little background music that must be the production work of Steve Aoki. I do love Chester’s vocals on just about every song he’s ever done, and they are great in the other song with Steve Aoki (A Light that Never Comes). Here they certainly don’t disappoint, though it is hard to get a real feel for them because it is being played live. From what I can hear, the song sounds like big room house and while that can be slightly generic, I’m sure Aoki has worked some magic in-between Chester vocals to make “Horizons” well worth the effort. Listen below to hear for yourself. We’ll await the full release soon.